Below post explains how to stream video content through ASP.Net Web API’s, below is the code for Video Controller which inherits from API Controller. API show both GET and POST approaches. Main thing to concentrate in the code is usage of Push Stream Content. PushStreamContent enables option to send data in small stream packets which then could be used on client side to stream videos, download large files etc. /// API Controller for streaming video files. /// Gets the live video. /// Gets the live video using post. This entry was posted in ASP.NET MVC, Uncategorized, Web API and tagged ASP.NET Web API, PushStreamContent, Video Streaming on May 18, 2017 by Aamol Gote. For Index Action we have 3 routes set up and when we hit any of these 3 routes http://FQDN/Home/Test or http://FQDN/Home/Test1 or http://FQDN/Home/Test2 we will always hit the Index action. For About action the Url will be http://FQDN/Users/about. When you combine attribute routing with convention-based routing, actions which do not have Route attribute for defining attribute-based routing will work according to convention-based routing. In above example Contact action will work according to convention-based routing (http://FQDN/HOme/Contact). For About action Url has to be http://FQDN/Orders/Users/about. All the routes where routing attribute has been spcified have to be prefixed with whatever common prefix declared at controller level (“Order” in this case). But the prefix does not get applied to convention based routing, so if we have to hit the contact action Url still remains the old one http://FQDN/Home/Contact. The convention-based routing is complex to support certain URI patterns that are common in RESTful APIs. But by using attribute routing you can define these URI patterns very easily. For example, resources often contain child resources like Clients have orders, movies have actors, books have authors and so on. It’s natural to create URIs that reflects these relations like as: /clients/1/orders. This type of URI is difficult to create using convention-based routing. Although it can be done, the results don’t scale well if you have many controllers or resource types. With attribute routing, it’s pretty much easy to define a route for this URI. This entry was posted in ASP.NET MVC and tagged ASP.NET MVC, Routing on June 17, 2015 by Aamol Gote. Explain Model Binding in ASP.NET MVC ? When this code executes, notice that the content is encoded as JSON rather than form url encoded. JSON is a serialization format so it’s in theory possible that we could straight deserialize that post to a Person instance, but ASP.NET MVC does not do that, reason for it is has to perform validation on input values, if it does not then the serialization would fail. Serialization is an all or nothing affair, when serialization fails, all you know is that the format didn’t match the type. You don’t have access to the granular details we need to provide property level validation. So to solve this we really want is a way bind each property of the model one at a time so we can determine which of the fields are valid and which ones are in error. Fortunately, the DefaultModelBinder already knows how to do that when working with the dictionary-like IValueProvider interface. All the ket value pairs form-encoded and JSON are coverted to type IValueProvider (Dictionary) and DefaultModelBinder already knows how to bind those values to a type while providing property level validation. The DefaultModelBinder will pull the Id value from the RouteData and the FirstName, LastName and Email values from the JSON when building up the Person object. Afterwards, it’ll perform validation without having to know that the various values came from different sources. In Summary – we use a value provider for JSON to enable property level validation of the incoming post and also so that model binding can build up an object by aggregating multiple sources of data without having to know anything about those sources. 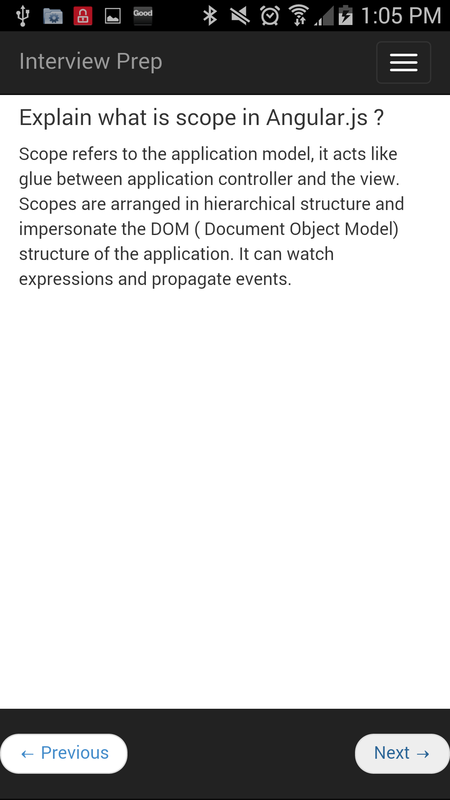 This entry was posted in ASP.NET MVC and tagged ASP.NET MVC Bundle, MODEL Binding on June 17, 2015 by Aamol Gote. 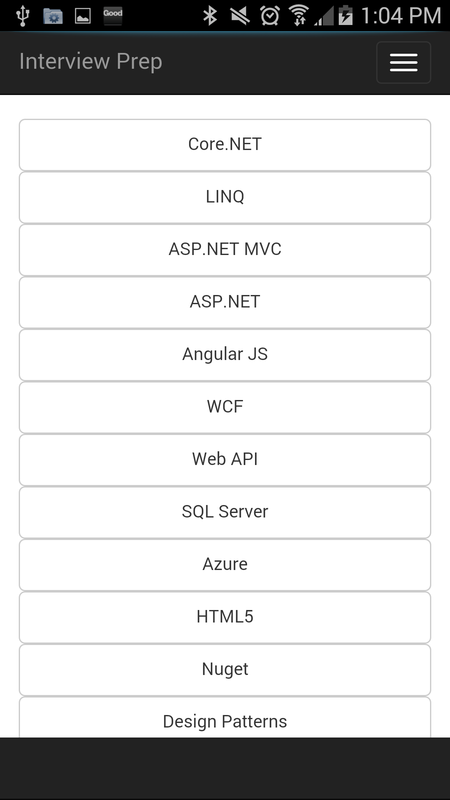 Try my Android Store App – App Contains Categorized Q&A for tech categories focus on OSS stack (Angular, Node) for building hybrid apps as well as MS Stack (.NET, ASP.NET, MVC, Web API…). Provides Question Count Statistics as well categorized question count break down. Questions and Answers periodically without app upgrade. 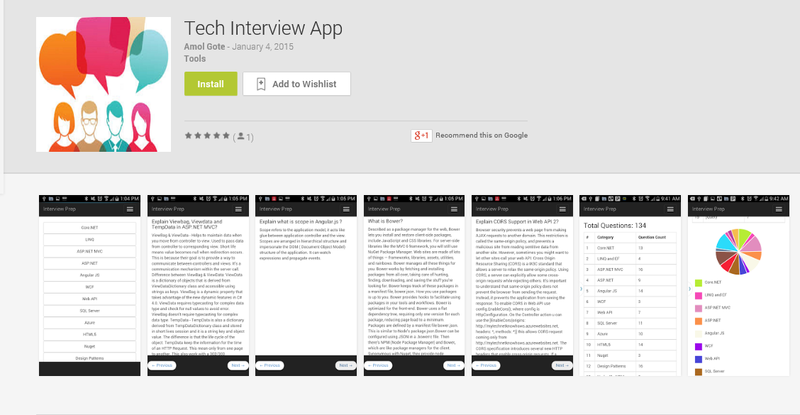 App is built using HTML 5, Angular JS and Web API in the back Ground. Plan is to add Questions Weekly to the Respository and make more enhancements :). This entry was posted in .NET, AngularJS, ASP.NET MVC, Web API and tagged Tech Interview App on January 10, 2015 by Aamol Gote. TempData is also a dictionary derived from TempDataDictionary class and stored in short lives session and it is a string key and object value. The difference is that the life cycle of the object. TempData keep the information for the time of an HTTP Request. This mean only from one page to another. This also work with a 302/303 redirection because it’s in the same HTTP Request. Helps to maintain data when you move from one controller to other controller or from one action to other action. In other words when you redirect, “Tempdata” helps to maintain data between those redirects. It internally uses session variables. Temp data use during the current and subsequent request only means it is use when you are sure that next request will be redirecting to next view. It requires typecasting for complex data type and check for null values to avoid error. generally used to store only one time messages like error messages, validation messages. 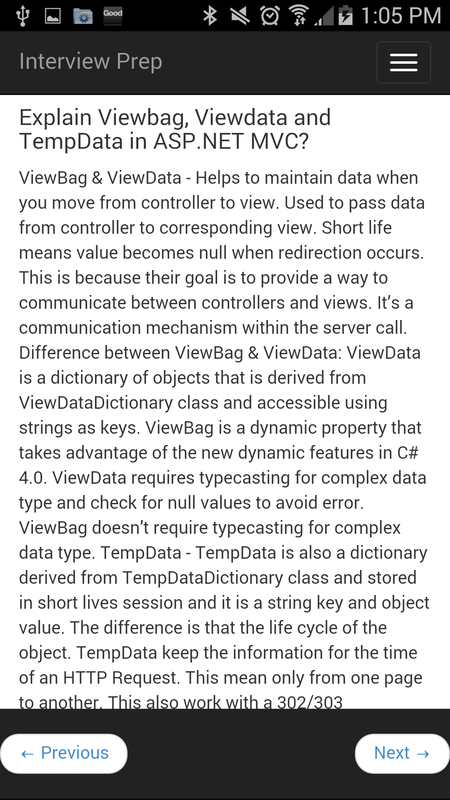 This entry was posted in ASP.NET MVC and tagged Tempdata, Viewbag, ViewData on September 25, 2014 by Aamol Gote. While one can store the output of Html.Partial in a variable or return it from a method, one cannot do this with Html.RenderPartial. The result will be written to the Response stream during execution/evaluation. Difference is Html.Partial returns an MvcHtmlString and Html.RenderPartial outputs straight to the response. This entry was posted in ASP.NET MVC and tagged Html.Action, Html.Partial, Html.renderAction, Html.RenderPartial on September 24, 2014 by Aamol Gote. 1. 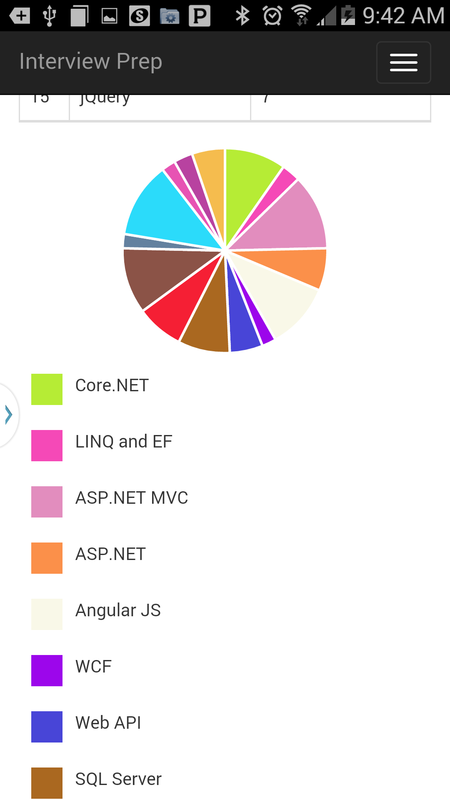 ASP.NET framework is heart of ASP.NET MVC application. 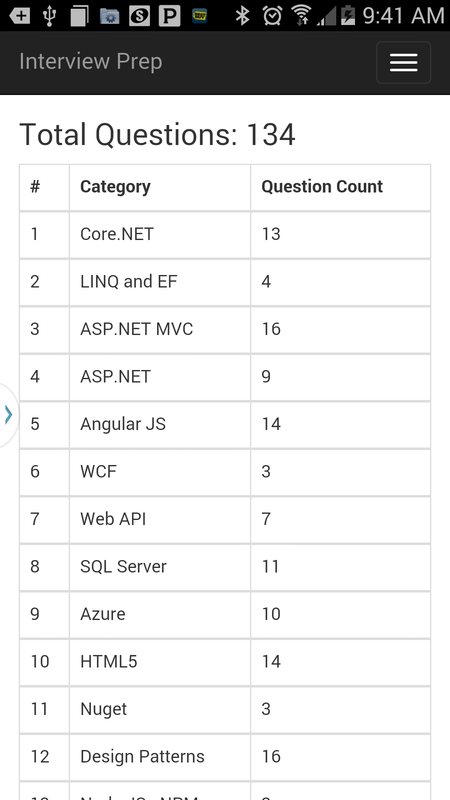 Basically, ASP.NET is a request processing engine. It takes incoming request as input and sends it through internal pipeline till the end point. 2. 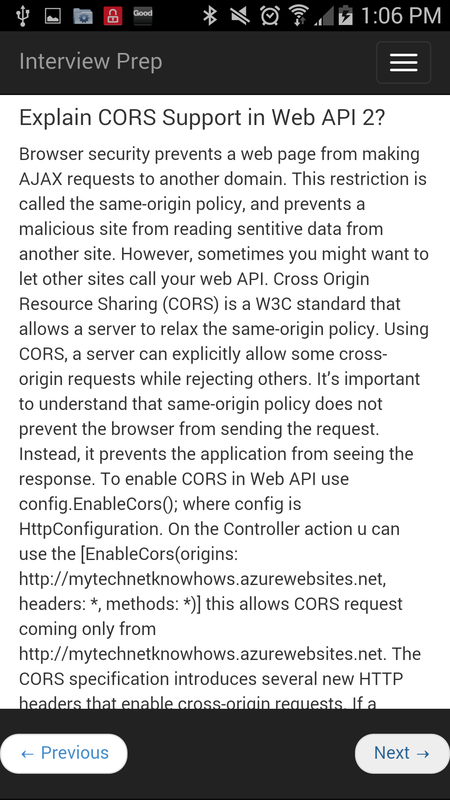 The life cycle of an ASP.NET application starts with a request sent by a browser to the Web server. 3. In integrated mode in IIS 7.0, a unified pipeline handles all requests. When the integrated pipeline receives a request, the request passes through stages that are common to all requests. These stages are represented by the RequestNotification enumeration. All requests can be configured to take advantage of ASP.NET functionality, because that functionality is encapsulated in managed-code modules that have access to the request pipeline. 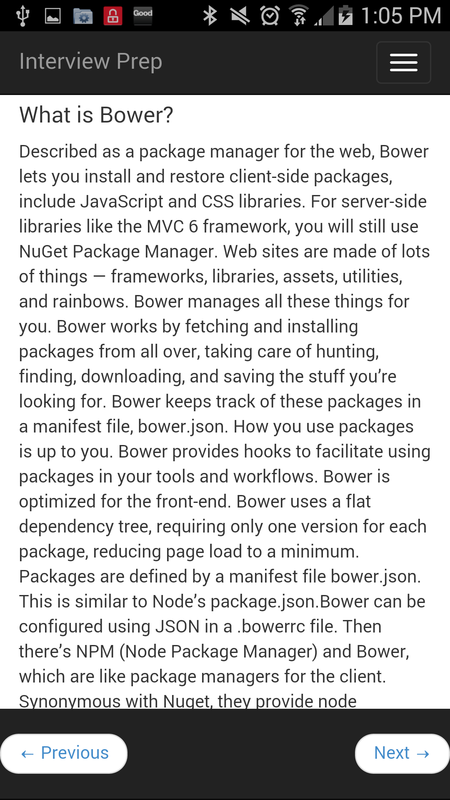 For example, even though the .htm file-name extension is not explicitly mapped to ASP.NET, a request for an HTML page still invokes ASP.NET modules. This enables you to take advantage of ASP.NET authentication and authorization for all resources. 4. So whenever a request comes from Client to Server, it will hit HTTP.SYS First. Hypertext Transfer Protocol Stack (HTTP.sys) – The HTTP listener is part of the networking subsystem of Windows operating systems, and it is implemented as a kernel-mode device driver called the HTTP protocol stack (HTTP.sys). HTTP.sys listens for HTTP requests from the network, passes the requests onto IIS for processing, and then returns processed responses to client browsers. 5. HTTP.SYS is Responsible for pass the request to particular Application pool. How HTTP.SYS comes to know where to send the request ? This is not a random pickup. Whenever we creates a new Application Pool, the ID of the Application Pool is being generated and it’s registered with the HTTP.SYS. So whenever HTTP.SYS Received the request from any web application, it checks for the Application Pool and based on the application pool it send the request. When Application pool receive the request, it simply pass the request to worker process (w3wp.exe) . Worker Process: : Worker Process (w3wp.exe) runs the ASP.Net application in IIS. This process is responsible to manage all the request and response that are coming from client system. 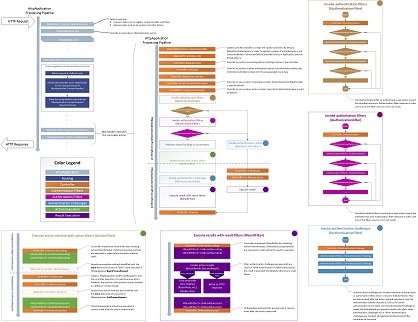 All the ASP.Net functionality runs under the scope of worker process. When a request comes to the server from a client worker process is responsible to generate the request and response. Worker Process loads up ASP.Net run time. Application domain is created. 4. After the application domain has been created and the HostingEnvironment object has been instantiated, application objects such as HttpContext, HttpRequest, and HttpResponse are created and initialized. The HttpContext class contains objects that are specific to the current application request, such as the HttpRequest and HttpResponse objects. The HttpRequest object contains information about the current request, which includes cookies and browser information. The HttpResponse object contains the response that is sent to the client, which includes all the rendered output and cookies. 5. After all application objects have been initialized, the application is started by creating an instance of the HttpApplication class. If the application has a Global.asax file, ASP.NET instead creates an instance of the Global.asax class that is derived from the HttpApplication class. It then uses the derived class to represent the application. An instance of the HttpApplication object is assigned to the request. The request is processed by the HttpApplication class. Different events are raised by this class for processing the request. 6. For MVC application in Application_Start event for Global.ascx RegisterRoutes(RouteTable.Routes) API for RouteConfig is invoked. 7. Inside the RegisterRoutes we register route by giving: route name and constraints. 8. The MapRoute is actually extension method in RouteCollectionExtensions.cs. Now, you can see how the route with particular URL is being register and associated with MvcRouteHandler. 9. Post this ASP.NET starts executing the HTTP Modules registered in the pipeline. In BeginProcessRequest there is a cycle that iterates all modules and execute each of it. 10. One of the module is UrlRoutingModule. The goal of this module is basically matching incoming request by URL with pre-defined Route configuration and return corresponding handler for this request. 13. For found matched Route it gets corresponding route handler (MvcRouteHandler). MvcRouteHandler was configured earlier in the application start. 15. This in turn calls the RemapHandler method in the HttpContext instance, to this method MvcHandler is passed. Remapahandler tells IIS which Httphandler we want to use. 16. 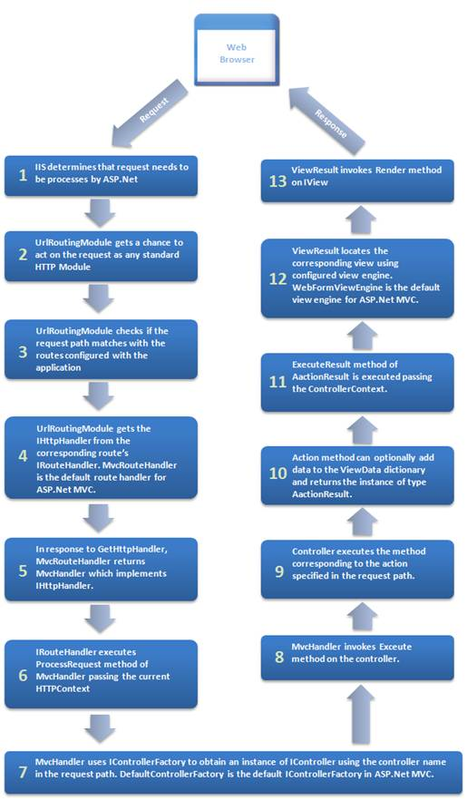 Once handler has been set, handlers process request method is been called by ASP.Net framework. 18. MVC handler supports both sync and async process request methods. controller instance and is assigned to IController. • Then the IController Execute method is invoked. • In async world the things are bit more complex. There are no one single method, but 2 instead. BeginProcessRequest and EndProcessRequest. • Then Controller BeginExecute method is invoked. b. This Execute() method calls the ExecuteCore() method which is declared abstract and is defined by Controller class. d. ExecuteCore() method calls ActionInvoker’s InvokeAction() method. 1. Initialize – Override to perform custom initialization before ControllerBase.Initialize sets Controller.ControllerContext with the encapsulated route data. 3. CreateTempDataProvider – Override to use a custom TempData provider. SessionStateTempDataProvider is used by default. 5. Controller then Invokes the Authentication Filters. Controller.OnAuthentication() API is invoked which then invokes the individual IAuthenticationFilters, prior to invoking filters it checks if the request I already authenticated if not then it invokes IAuthentication Filters. Use IAuthenticationFilter to authenticate a user action toward the intended resources. Authentication filters execute in order until one of the filters returns a non-null result. 6. Post Authentication Filters Controller invokes the Authorization filters. Controller.On Authorization() API is invoked which then invokes the individual IAuthorizationFilters, prior to invoking filters it checks if the authorization context existis if not then it invokes IAuthorization Filters. Use IAuthorizationFilters to authorize a user action toward the intended resources. Authorization filters execute in order until one of the filters returns a non-null result. 7. Then controller calls the InvokeAction method, this is where the action filters kick in. Action filters are executed before (OnActionExecuting) and after (OnActionExecuted) an action is executed. IActionFilter interface provides you two methods OnActionExecuting and OnActionExecuted methods which will be executed before and after an action gets executed respectively. You can also make your own custom ActionFilters filter by implementing IActionFilter. 8. When action is executed, it process the user inputs with the help of model (Business Model or Data Model) and prepare Action Result. 9. Controller then Invokes the Controller.OnResultExecuting() API. Controller implements IResultFilter (by inheriting ActionFilterAttribute). OnResultExecuting methods are executed in order before the result is executed. 11. Controller then executes the ActionResult.ExecuteResult() which prepares the return ActionResult. a. The Action Result type can be ViewResult, PartialViewResult, RedirectToRouteResult, RedirectResult, ContentResult, JsonResult, FileResult and EmptyResult. Various Result type provided by the ASP.NET MVC can be categorized into two category- ViewResult type and NonViewResult type. b. The Result type which renders and returns an HTML page to the browser, falls into ViewResult category and other result type which returns only data either in text format, binary format or a JSON format, falls into NonViewResult category. c. ViewResult type i.e. view and partial view are represented by IView(System.Web.Mvc.IView) interface and rendered by the appropriate View Engine which is this case is Razor. d. View generation and rendering is handled by IViewEngine (System.Web.Mvc.IViewEngine) interface of the view engine. e. By default ASP.NET MVC provides WebForm and Razor view engines. You can also create your custom engine by using IViewEngine interface and can registered your custom view engine in to your Asp.Net MVC application start. 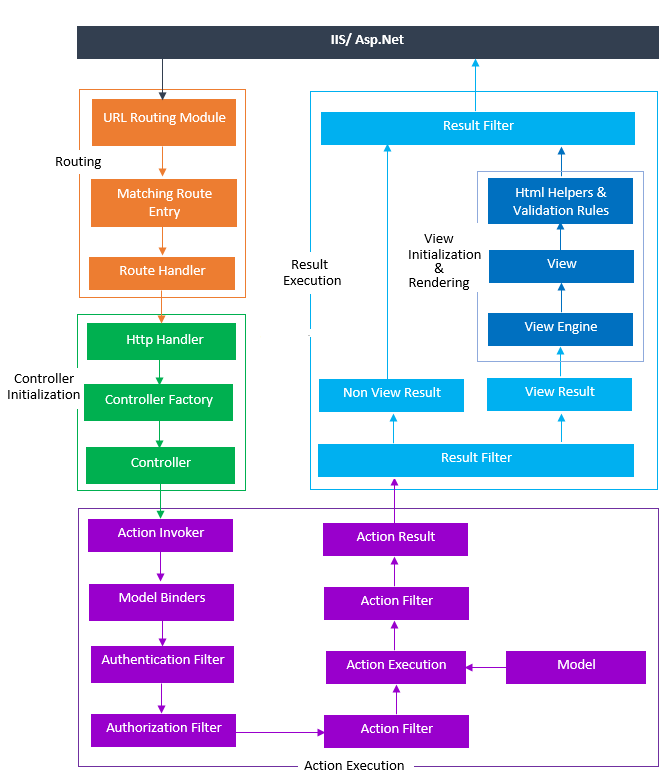 f. Since ViewResult is the most common type of ActionResult we will look into what happens if the the ExecuteResult() method of the ViewResult is called. Following happens after the ExecuteResult() method of ViewResult is called. iv. The Render() method of the ViewEngineResult is called to Render the view using the ViewEngine. v. The response is returned to the client. a. AuthenticationFilter – Executes after Controller.OnAuthentication. This entry was posted in ASP.NET MVC and tagged ASP.NET MVC Life Cycle, ASP.NET MVC Request Life Cycle on April 13, 2014 by Aamol Gote.